Every second, we’ll execute the run function. It will allocate a giant string, create a closure that uses it, invoke the closure, and return. After it returns, the closure can be garbage collected, and so can str, since nothing remains that refers to it. But what if we had a closure that outlasted run? Looks like we’re using an extra megabyte every second! And even clicking the garbage can icon to force a manual GC doesn’t help. So it looks like we are leaking str. But isn’t this just the same situation as before? str is only referenced in the main body of run, and in doSomethingWithStr. 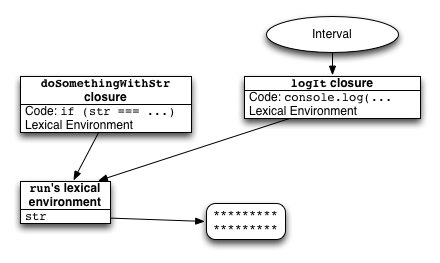 doSomethingWithStr itself gets cleaned up once run ends… the only thing from run that escapes is the second closure, logIt. And logIt doesn’t refer to str at all! But as soon as a variable is used by any closure, it ends up in the lexical environment shared by all closures in that scope. And that can lead to memory leaks. You could imagine a more clever implementation of lexical environments that avoids this problem. Each closure could have a dictionary containing only the variables which it actually reads and writes; the values in that dictionary would themselves be mutable cells that could be shared among the lexical environments of multiple closures. Based on my casual reading of the ECMAScript 5th Edition standard, this would be legitimate: its description of Lexical Environment describes them as being “purely specification mechanisms [which] need not correspond to any specific artefact of an ECMAScript implementation”. That said, this standard doesn’t actually contain the word “garbage” and only says the word “memory” once. // being optimized out of it. If you remove this function, there is no leak. // will never get cleaned up!